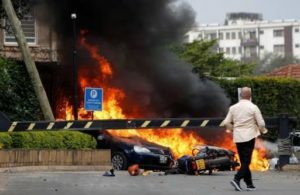 Kenyan government should put victims front and center in its response to the January 15, 2019 attack on the DusitD2 hotel in Nairobi, Human Rights Watch said today. The government should ensure that the crime is investigated promptly and that those responsible are brought to justice. The casualty figures are not clear yet. The Kenya Red Cross, which was involved in rescue operations during the attack, said at least 24 Kenyans were killed, whereas Kenyatta said in his official address that 14 had died and many others were wounded. As authorities work to respond to this crisis, they should put in place plans to ensure access to essential medical services for the victims, Human Rights Watch said. In the past, the Kenyan authorities have failed to support victims of Al-Shabaab attacks, many of whom continue to struggle with the physical injuries and trauma arising from the attack. Since October 2011, when Kenyan military deployed in Somalia, there have been several Al-Shabaab attacks in Nairobi and elsewhere. On September 21, 2013, heavily armed men attacked the Westgate Mall, a popular upscale shopping center in Nairobi, killing at least 67 people and injuring many others. Al-Shabaab claimed responsibility for the attack and said that it was in response to Kenya’s October 2011 military intervention against Al-Shabaab in Somalia. On June 15, 2014, armed gunmen attacked Mpeketoni center, a cosmopolitan center in Lamu county, and continued attacks over five weeks in other villages in Lamu and Tana River counties, in the coastal part of Kenya. The attackers targeted mainly non-Muslims of various ethnicities and police stations and other government installations and killed government security officers. On April 2, 2015, armed gunmen attacked Garissa University College, killing at least 147 people and injuring close to 100. Al-Shabaab claimed responsibility for the attack in communications with journalists and posted a statement on its website. Kenya’s efforts to tackle rising insecurity have been marred by serious human rights violations, including extrajudicial killings, enforced disappearances, arbitrary detentions, and torture by security forces, especially in Kenya’s northeast, its coastal region, and in Nairobi’s Eastleigh neighborhood. The government has repeatedly promised to investigate allegations of abuses by its forces. Kenyatta announced an investigation into the attacks at Westgate and said he would form a commission to review the response of the security forces but the government has taken no action.